Angeline is a PhD candidate at the School of Psychology, National University of Ireland Galway. Her research interests include psychological treatment for pain management and the design and development of psychological interventions using information and communication technology (ICT). Angeline completed her B.A. in Psychology at the National University of Ireland Maynooth (2011) and her MSc in Health Psychology at the National University of Ireland Galway (2012). For her masters Angeline evaluated online delivery of mindfulness based stress reduction for adults with chronic headache. 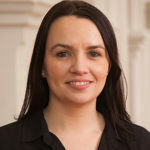 In 2012, Angeline became involved with the Centre for Pain Research at NUI Galway and undertook her Doctoral training in Psychology and Health. Angeline’s Doctoral research is focused on the development and evaluation of a web-based, pain management programme called Feeling Better for early school-age children with chronic pain. Angeline is a recipient of a four-year scholarship from the Hardiman Research Foundation at NUI Galway.